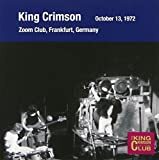 Mastered audience recording from the 13th of October, 1972 concert at The Zoom Club, Frankfurt, Germany. This double CD has maybe the longest improvisations this line-up ever did, one of them runs over 44 minutes and it's faded out as the tape probably ran out before the jam ended! The sound quality is quite poor, but you can hear all of the instruments. Most versions of their basic repertoire are not very good performances, but it interesting to listen how some of their future numbers have evolved. There are some very familiar riffs and rhythms heard in some of the jams, which were later matured to complete songs (like "Fallen Angel", "Lament" and "Dr. Diamond"). 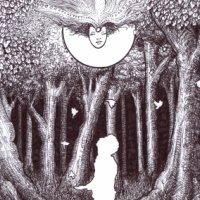 I would suggest this double CD for fans of KING CRIMSON's line-up with Jamie Muir and for those who are interested of chaotic improvisational music. As this is a KCCC release (and there's also the "original" bootleg moving around), a casual consumer probably wont buy this by mistake from the shop. 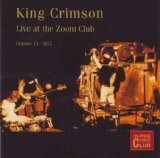 Post a review of KING CRIMSON "Live at The Zoom Club"